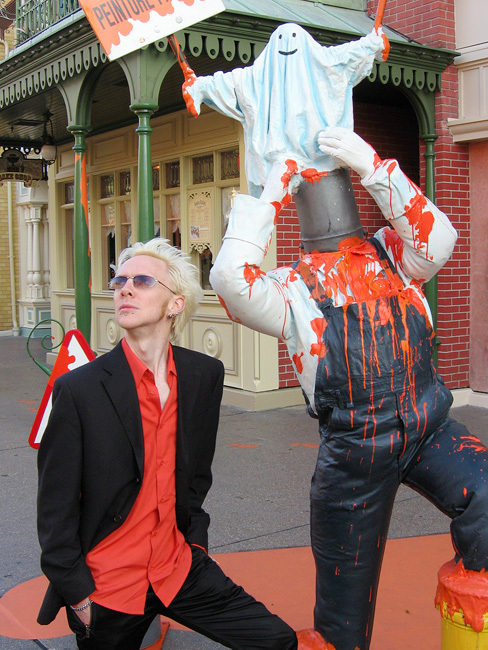 Me at Disneyland Paris at Halloween. Photo by Jon Morris. Halloween is a much smaller affair in France than it is in the States, but if you're a Halloween fanatic like I am, it's worth putting in the extra effort to find something cool going on. When people from back home ask me if I miss anything about my life in the States, American-style Halloween is the first thing that springs to mind. When you're as Halloween-obsessed as I am, living in (or visiting) a country that barely acknowledges the holiday is tough! The difference here simply comes from the fact that Halloween isn't part of France's culture. 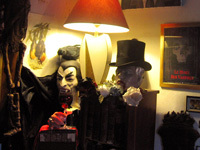 Most of the time in October, I'll seen one or two small Halloween displays in shop windows in Paris, and maybe three or four bars with fliers in the window advertising Halloween parties. The French don't decorate for Halloween, practically no one throws Halloween house parties (except us expats), there are no Halloween stores (although there are several year-round costume shops); no one carves pumpkins, and kids don't trick-or-treat; in fact, a lot of French people I've talked to think trick-or-treating is just something in the movies! They can't believe it when I tell them what a big deal Halloween is for a lot of Americans, and that these days it's for adults as well as kids. It's a drag; they don't know how much fun they're missing out on! 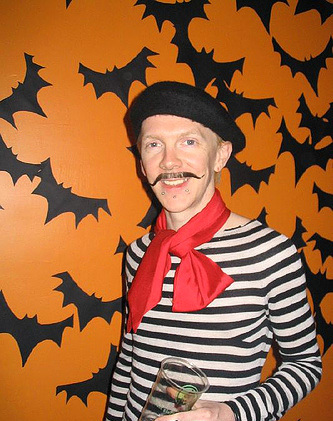 Haha, I was totally a French guy for Halloween while visiting the States in 2006. Oh la la! Okay, so you're stuck in Paris, and it's Halloween, so you have to do something to celebrate! Fortunately, Parisians will use any excuse for a party, and there are in fact several bars and clubs in the city that advertise Halloween parties every year, and these may or may not satisfy your Halloween cravings at least somewhat. Be warned, these "Halloween" parties may or may not involve: a jack o' lantern or two for decor, and maybe a handful of people will show up in costume (often just the ladies), or maybe nobody will. The dj may or may not play Thriller. And that's it. It's just an excuse to have a party, really, and maybe hook a few tourists who're missing out on Halloween back home. Searching online for Halloween event listings in recent years, I've seen a few parties advertised that mention things like, "guests in costume will be rushed to the front of the line" or that wearing a costume enters you in a drawing to win prizes, and that stuff's fine; I'm glad they're trying to get people into the spirit! (Unfortunately, all the event sites I've ever found listing Halloween parties in Paris are in French only.) But for me, Halloween is all about the spooky ambiance, the ghosts and goblins, and you're just not going to find that at any party in Paris. But at least you can go out and drink and dance if you want! And I say, if you're from the States and Halloween is part of your culture, why not go ahead and put together an amazing costume to wear to the parties? Even if you end up being one of only a few people in costume, your fellow revelers will certainly give you a ton of respect and great compliments for going all out for the holiday, I guarantee it. And besides, it's fun to wear a costume! Halloween is the one night you're allowed and no one will think you're crazy! While there are no haunted houses you can visit in Paris, there is a guided ghost tour, called Mysteries of Paris  Ghost & Vampire Tour. You can buy tickets on their website. 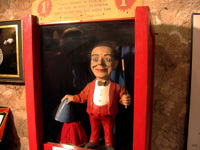 I took this tour back around Halloween 2009 and had a great time. Every October, Disneyland Paris decorates the heck out of their park for Halloween and has cute Halloween related events and activites. I'm not a big fan of Disney stuff in general, but I'll admit this is a fun time! I had a couple friends visiting from the States a while back, and they'd wanted to check out Disneyland Paris and were kind enough to invite me along, and we had a blast. Of course the Disney Halloween ambiance is mostly for kids, but still, this is actually probably the closest thing to the fun American Halloween vibe that you'll find anywhere in France. The Phantom Manor  the European counterpart to Disney's Haunted Mansion in their American parks  is of course open all year round, but it's a definite highlight of the visit during Halloween. 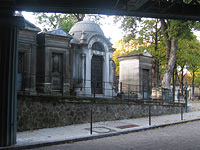 Of course, you can also visit Père Lachaise or any other eerie Paris cemetery to try to capture a bit of Halloween ambience, but keep in mind they're only open during the daytime. 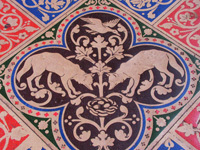 And don't forget the Catacombs! Even if there's nothing particularly Halloween-y about these places, hanging out with skeletons and crumbling tombs can be an okay substitute. Happy haunting and joyeux Halloween! Vampire museum on the edge of Paris.